Gary Sheffield needs no introduction for anyone with a serious interest in the First World War, as he is one of the leading academic historians of the conflict. This book brings together a collection of his essays, 13 chapters spanning nearly 30 years of research and writing, brought together with some minor amendments. One new piece has been written just for the book, covering some of Sheffield’s current research into General Henry Rawlinson. The three parts of the book cover context, command, and morale. The first chapter provides a brief summary of why Sheffield believes the war had to be fought, and why he believes the BEF became an effective fighting force by the end of the war – in essence a summary of the main points from arguably one of his most influential books, ‘Forgotten Victory’. The second chapter moves on to examine the coalition of the entente, particularly the importance of the relationships between the individual commanders. Sheffield also touches on the nature of the coalition between the Empire’s forces, and the difficulty of balancing national interest with friendship. The new chapter on Rawlinson gives an interesting insight into Sheffield’s next potential publication. It provides a comparison of Haig and Rawlinson’s backgrounds and early careers, highlighting that they held fundamentally different views on how to conduct operations – Rawlinson an early advocate of bite and hold; Haig preferring an all-out offensive followed by mobile operations to take advantage of breakthroughs. Rawlinson was blamed for the lack of progress at Neuve Chapelle in 1915, and his career was essentially saved by Haig. Yet in subsequent operations Rawlinson often subverted Haig’s intentions. As a precursor to a future work, this is an interesting summary of how the relationship between these two men impacted on the course and conduct of the war. Subsequent chapters include an analysis of Australian command at Pozieres, with Sheffield surmising that the Australian Corps in 1916 was not as developed as it was by 1918, and an assessment of Gough as an Army commander, where Sheffield puts forward the view that Haig’s support of Gough was not justified. Chapters examining Haig and the BEF in 1917 (focusing on Vimy Ridge and the Battle of Arras), and the British Army in 1918, round off the section on command. 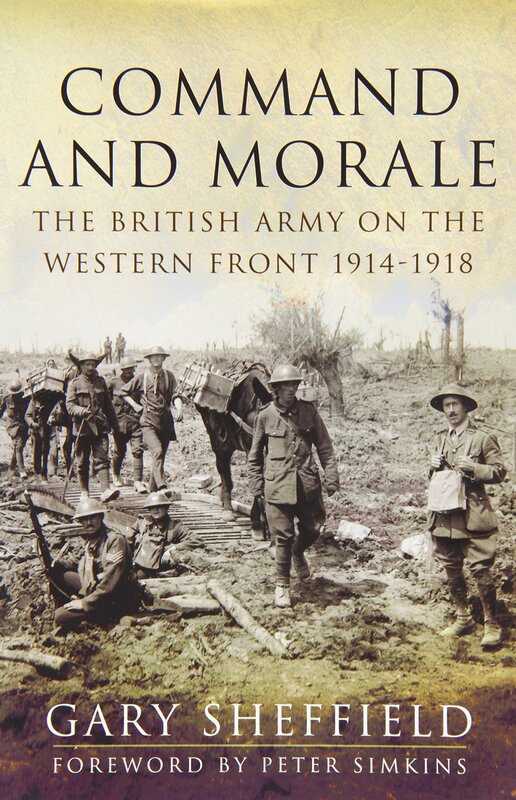 The third part of the book covers morale including an overview of morale in the British Army (British morale remained intact in 1918 whilst German morale was flagging); the relationship between officers and the other ranks (paternalistic, but led to an over-reliance of men on their officers), and a battalion study of the 22nd Royal Fusiliers, based on Sheffield’s MA thesis. This research highlighted the difference in morale to a regular battalion due to the battalion’s composition, i.e predominantly middle-class. It was fairly relaxed around discipline, and proof of good morale is in its record ‘in the field’. A chapter on the role of military police highlights that their contribution to the war has been undervalued. The chapters serve as brief overviews of each area, and whilst the overall thread of each part loosely ties them together, this is not (nor does it pretend to be) a comprehensive study of each area. However they naturally have thorough references and at a minimum provide the reader with suggestions for further reading. Sheffield has a difficult role, trying to bridge the gap between academic and popular historian. Works such as ‘Forgotten Victory’ and ‘The Somme’ have certainly achieved popular acclaim; his more recent work on Douglas Haig (The Chief) and forthcoming work on Rawlinson are more likely to appeal to those with a keen interest in the conflict and the way it was conducted. This volume is academic, yes, but still accessible, although likely to be of interest only to diehard Sheffield fans or those with a more ‘scholarly’ interest in the war.